After experiencing bullying and discrimination in high school, Ed Blumenthal, Executive Vice President/Wealth Management, Stedmark Partners, made a decision as an adult to give back and make a change, so others wouldn’t have to go through what he did. 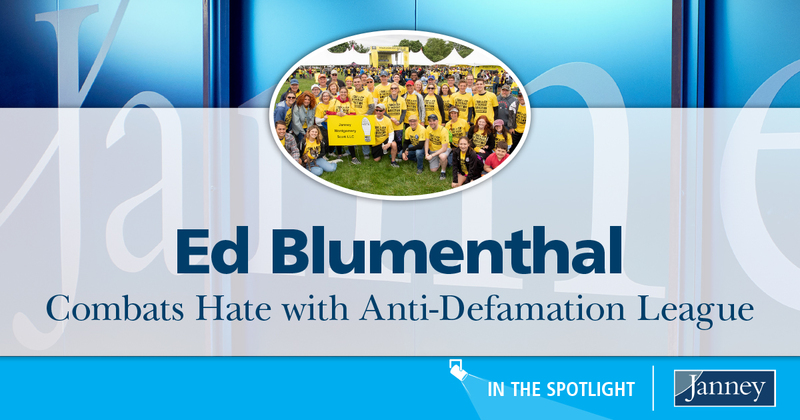 For nearly a decade, Ed has partnered with the Anti-Defamation League (ADL) in the Philadelphia region to make change a reality, and to help support the organization’s efforts to imagine and build a world without hate. In addition to his personal contributions, Ed serves as Chair of Development on ADL’s Regional Board of Directors, where he fundraises for the organization’s many programs. One such program is the organization’s annual "Walk Against Hate." For the past eight years, Ed and his family, friends, and Janney teammates have walked to combat hate and have raised nearly $90,000. One hundred percent of the funding that he raised directly benefits ADL’s important programming, training, and research. “I think building an understanding and learning about other cultures makes the world a better place, which is why ADL’s education and training is so important. The ADL offers impactful education and a powerful support system for students to fight bias and counter cyber hate. I know what it’s like to face bullying and I don’t want other kids to have to go through that. I wish that when I was in school there were resources like the ADL for me to turn to.” said Ed. The ADL works tirelessly to defend civil rights, combat anti-Semitism, and educate students, police officers and the community to fight hate, extremism, cyber bullying, and all forms of bias. Through ADL’s "No Place for Hate" educational initiative, they reached 300,000 students last year with their message of embracing and celebrating diversity and inclusion. ADL also educated approximately 400 Philadelphia police officers through its Law Enforcement and Society program, where they explored the relationship and potential bias that occurs between the police and the citizens they serve. Ed is proud that both of his children, Carly, 20, and Kyle, 18, decided to become Peer Trainers while they were in high school. As Peer Trainers, they committed to taking action against prejudice by leading workshops and discussions with peers about the issues that impact their school. He said, “I was so happy that they decided to become educators. I try to lead by example and show them the right thing to do, and this really means so much to me. Carly, who is an illustration and film studies student in NYC, created the design for a pair of ADL sneakers that included anti-hate messaging. These one-of-a-kind sneakers were featured on the organization’s 2017 brochure, and worn by Jason Sirois, ADL’s National Director- No Place for Hate at Anti-Defamation League, at the annual No Place for Hate school designation ceremony. Ed, who has been at Janney for more than two decades, is also proud of Janney’s support of diversity and inclusion, both financially and in the Firm’s work force. “For the past two years, Janney has generously been a sponsor of the ADL’s Diversity Expo at the Walk Against Hate. 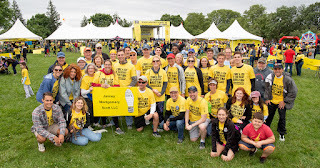 Held at the Walk, the Expo celebrated the wonderful diversity of the Greater Philadelphia Area and featured 38 other non-profit organizations that showed the various cultural and community groups that share the same vision as the ADL,” said Ed.